“No, he’ll be spoiled rotten,” I quip back as the door pings open and we exit the elevator. 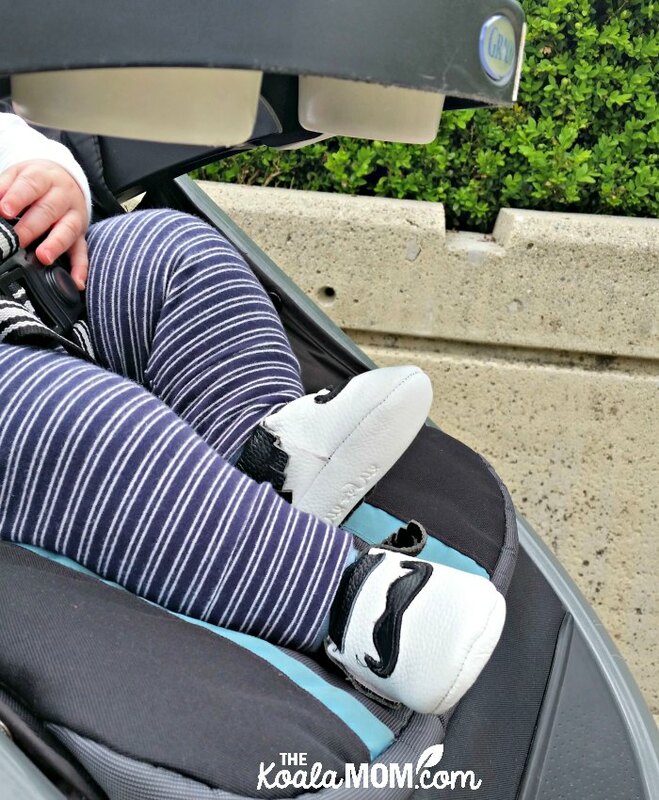 Yes, Joey has big shoes to fill as the first boy in our family. As Sunshine will tell anyone we meet, he has not only four older sisters but also four older girl cousins. He’s the first grandson on either side of the family. He’s named for my husband’s father and for five men on my side of the family (my grandpa, dad, and brother share the same middle name, which was also my maternal grandpa’s name, and he was named for his uncle who served and died in World War II). 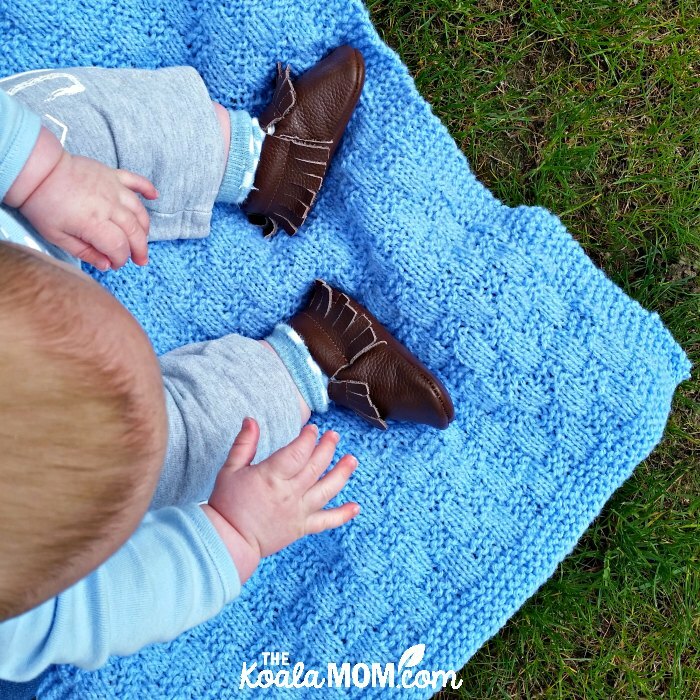 When he wears his blue jeans and brown fringed baby moccasins, I think of the farmers in our family. Maybe he’ll love John Deere tractors like certain uncles do. Maybe he’ll be a whizz at fixing big engines. Maybe he’ll farm part-time with his uncle, like my brother does with our uncle. Or maybe he’ll retire and buy the farm, like his grandpa did. 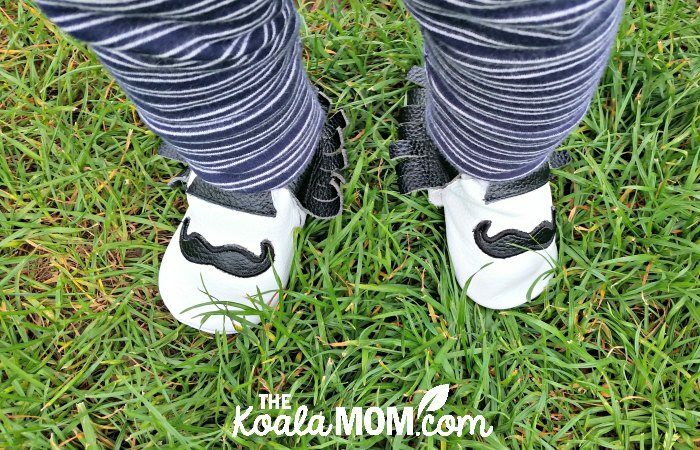 When he happily kicks his feet, with black mustaches on his toes, I think of what it will be like to have a teenage boy around. I’ve been warned about teenage girls (although I’m looking forward to that—BABYSITTERS! ), but I grew up with brothers. I know what teenage boys are like. So I imagine Joey shaving the peach fuzz that will cover the dimple he gets from Grandma, or trying to grow a goatee as legendary as his uncle’s. When he wears his fancy (hand-me-down) suit and black leather baby moccasins, I picture him as an engineer in an office like his grandfathers. Or waiting at the end of the church aisle to welcome his bride. Or laying face-down on the floor of a cathedral to receive Holy Orders. Whatever shoes he decides to wear as he grows up, I want him to know that I love him. 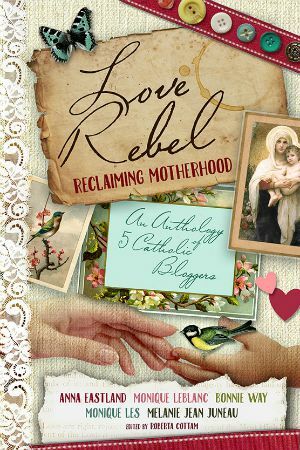 I want him to know he can follow whatever path he chooses or feels God is calling him to. My family always supported me in my dreams and goals. My parents could have asked me what job I thought I could get with an English degree, but they never did. They just told me to go for it (and gave me time to study, and drove me to my classes, and cheered for me at awards ceremonies). My grandparents were also always there for me, supporting me and loving me unconditionally. One of the joys in this parenting journey is watching our children choose their paths. I’ve had fun watching my older daughters’ personalities, talents, and interests develop as they’ve gotten older. They are each unique, despite their shared genes and upbringing. I’m often asked how having a baby boy is different than a baby girl. So far, Joey has been a lot like his sisters were at this age… maybe he’s a bit bigger, maybe he’s starting to crawl a bit younger, but otherwise, babies are babies. As he gets older, though, I know he’ll likely be his own person—just as each of his sisters is. Right now, they’re eager to help him pick out his shoes and onesies. Soon, they’ll be holding his hands as he learns to walk, and then they’ll be teaching him to build LEGOs, and not long after that he’ll be the one teasing them (maybe about boys!). there are so many ways to walk it. So yes, he may have big shoes to fill, but they are his own shoes. Maybe he’ll follow in the family footsteps or maybe he’ll make his own. I’m happy to walk this journey with him as his mom, and see where he goes. What shoes do you imagine your children wearing as they grow up? 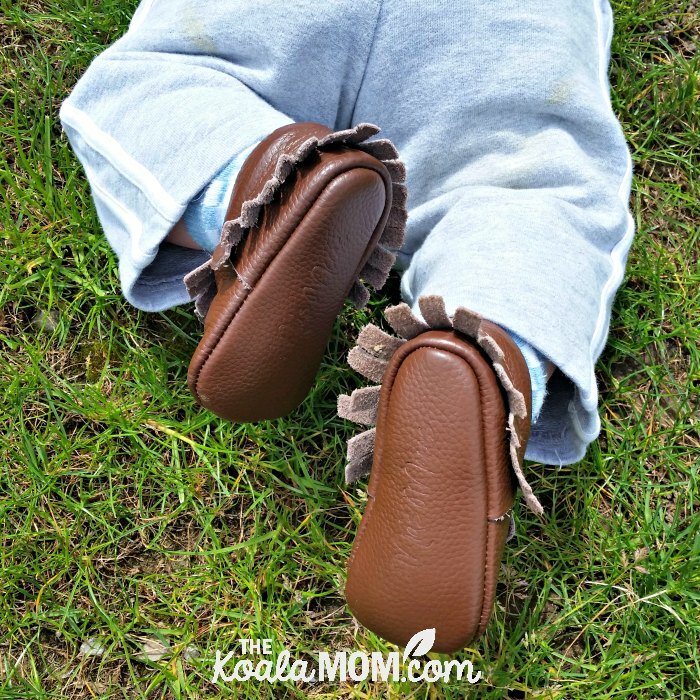 Joey’s adorable baby moccasins are from Mia’s Moccs. 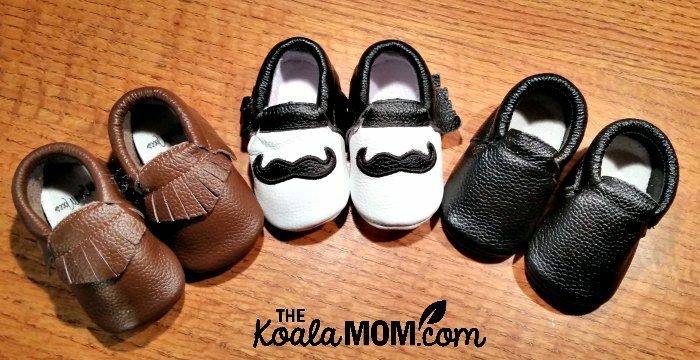 They have a great selection of affordable baby shoes for both boys and girls. Shop their moccasins on the website or follow them on Facebook, Pinterest and Instagram. 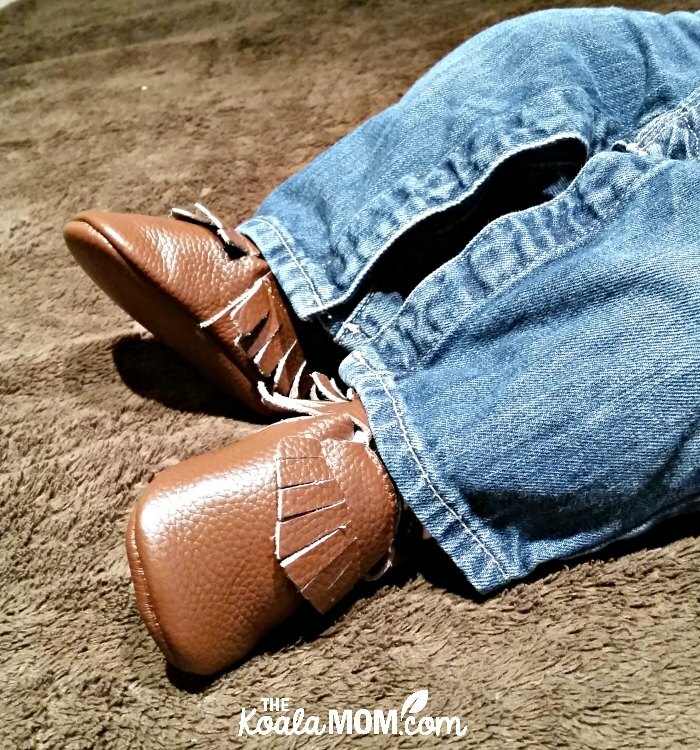 I received these baby moccasins for review courtesy of Mia’s Moccs; all opinions expressed are my own. What a precious message, Bonnie! Thank you for this reminder!